KUALA LUMPUR (Dec 23): The FBM KLCI closed five points or 0.29% higher on window dressing by fund managers. The KLCI settled at 1,749.05 points at 5pm, extending gains from a 28.06-point rise yesterday. Today, remisiers noted an improved market sentiment. “Retail confidence is returning. The more positive sentiment today is likely due to year-end window dressing,” InterPacific Securities’ remisier Sam Ng told theedgemarkets.com over the telephone. Ng said the local market was also lifted by overnight US trade performance. According to Reuters, a holiday hush had settled over Asian markets after Wall Street closed at historic highs while oil prices recouped just a little of the losses suffered when Saudi Arabia dismissed curbing supply. A revival in risk appetite undermined the safe haven yen and kept the U.S. dollar elevated across the board, while sovereign bonds were content to sit on recent gains. Equity investors chose to focus on the benefits that falling fuel prices would have for consumer spending power. Meanwhile, the ringgit weakened to 3.4960 versus a firmer US dollar. The US dollar strengthened in anticipation of US policy makers raising interest rates. In Malaysia, Bursa Malaysia saw 1.51 billion shares valued at RM1.67 billion traded. There were 281 gainers and 541 decliners while 247 counters remained unchanged. Top gainers included British American Tobacco (M) Bhd, Kuala Lumpur Kepong Bhd and Dutch Lady Milk Industries Bhd. Decliners were led by Hong Leong Capital Bhd, Allianz Malaysia Bhd and Sarawak Oil Palms Bhd. The most actively traded stock today was Hubline Bhd, with 86.6 million shares changing hands. 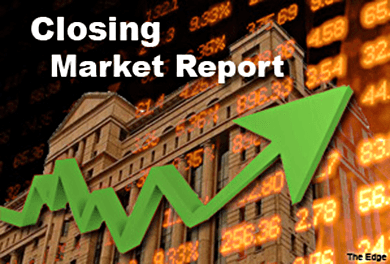 The stock fell 0.5 sen to close at 3.5 sen.
Across the region, Hong Kong’s Hang Seng declined 0.32% while South Korea’s Kospi was down 0.21%. Japan markets were closed for a holiday.